A new spin on our classic design Before the introduction of the OXO Good Grips Salad Spinner in 1998, crank or pull-tab salad spinners were considered high-end products. Some people even used the spin cycle of their washing machine to dry lettuce. Our easy-to-use Spinner transformed the tool into an everyday kitchen essential. Nearly 20 years later, we revisited the Spinner to make some updates while keeping the top features and original inspiration: a children’s top. With a modern design that complements contemporary kitchens and an improved brake that stops on a dime every time, we think you’ll love our new spin on the classic design. Dry salad greens with a simple press of the soft, non-slip knob. 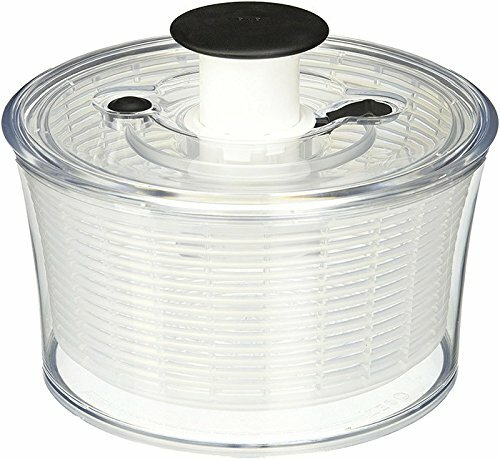 The non-slip base keeps the bowl steady on the countertop, and the updated built-in brake button stops the Salad Spinner for unloading. The basket doubles as a colander, and the lid comes apart for easy cleaning. A new take on our classic spinner -- in a compact, convenient size With an updated design to complement modern kitchens, an improved brake that stops on a dime, we think you’ll love our new spin on the Little Salad and Herb Spinner. Clean and dry lettuce or herbs with a one-handed pump. The non-slip base keeps the bowl steady on countertops and the built-in brake button stops the Little Salad and Herb Spinner for easy unloading. The small size makes it perfect for single-servings and streamlined storage. With a basket that doubles as a colander, and a lid that comes apart for easy cleaning. 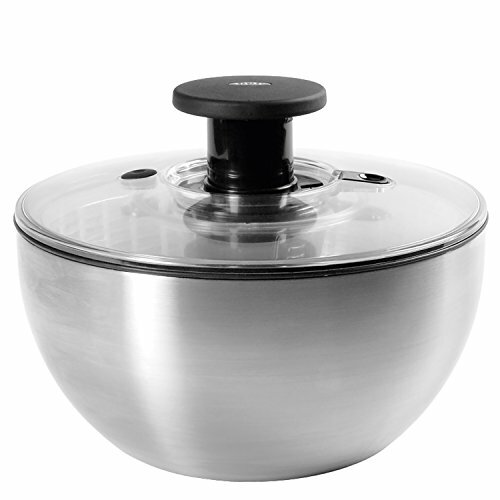 An elegant twist on our classic, award-winning spinner.The OXO SteeL Salad Spinner combines the one-handed functionality of our patented pump and brake with the elegance of stainless steel.To use: push the soft, non-slip pump to spin your lettuce or other leafy green vegetables dry. The non-slip base keeps the bowl steady on the countertop, and the patented built-in brake stops the Salad Spinner for unloading. The basket doubles as a colander, and the lid comes apart for easy cleaning. 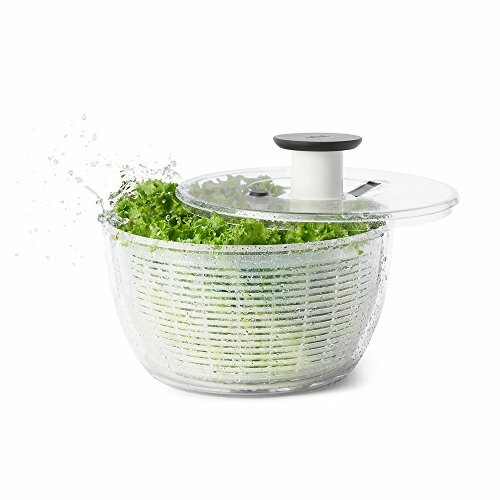 This miniature version of the SoftWorks salad spinner has a capacity of 10 ounces and is the perfect size for drying berries, herbs, or salad for two. This little spinner has the same patented pump mechanism as its predecessor, which sets it spinning with one push on the soft knob. A non-slip base keeps the bowl rooted to your countertop while your lettuce is in motion. Water drains through the spinner's colander into the plastic bowl and a patented brake button lets you stop the spinning when the leaves are dry. The lid to the salad spinner also has a airtight lock so you can store greens right in the bowl after draining and drying to extend their storage life. All components of this spinner are dishwasher-safe. Making a quick dressing is a cinch with the OXO Good Grips Mini Salad Dressing Shaker. The watertight Shaker offers a clean, neat and convenient way to mix, serve and store dressings, sauces and marinades. The top unscrews to reveal a wide opening ideal for adding a range of ingredients like oil, vinegar, mayonnaise, mustard, garlic, onions and spices. 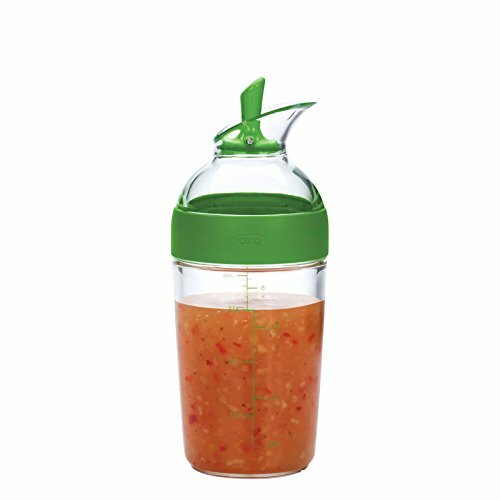 The Shaker is made of a BPA-free, break-resistant and dishwasher safe material. Once ingredients are added, screw the top on and shake to quickly mix dressings with no spills. The top lever flips back for pouring and forward to seal. Use the Shaker to store leftover dressing and sauce right inside the fridge. OXO SoftWorks Salad Spinner. 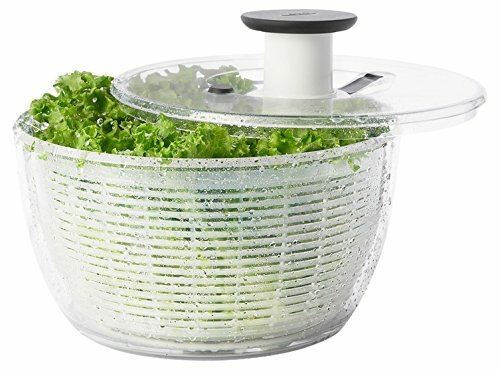 A Cook's Illustrated Top Pick, our groundbreaking design lets you clean and dry salad greens one-handed! Easy to Use: wash and dry lettuce, herbs, fruit or leafy green veggies with a simple push of the pump. The patented brake button stops the spinner on a dime. Signature Non-Slip Pump and Base: The narrow non-slip base keeps the bowl steady on countertops and takes up less space, the non-slip pump is soft to the touch. BPA free. 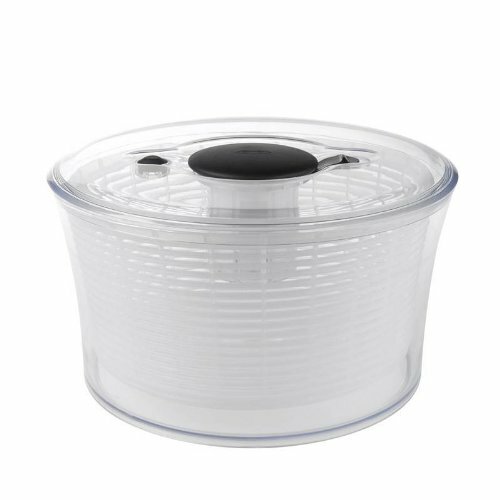 Salad Spinner, 10.5 x 6" H/ 26.5 x 15cm H, 5qt / 4.7L capacity, clear, plastic, BPA Free. Easy, one-handed operation with pump mechanism and brake button. Soft, non-slip knob locks down for convenient storage. Non-slip ring keeps bowl steady on countertop. Dishwasher safe. Gift boxed. 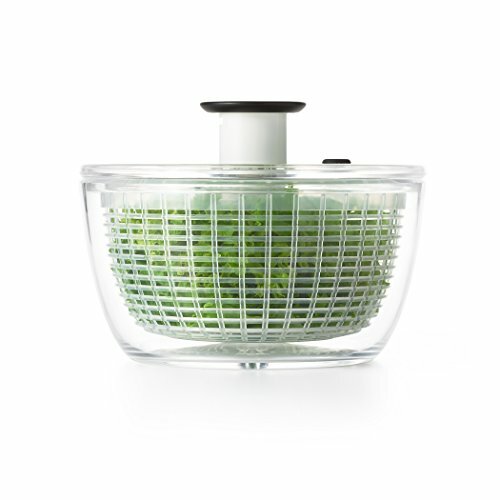 The Oxo Good Grips Salad Spinner family is growing! The Little Salad & Herb Spinner, a small version of our big Spinner, is perfect for drying salad for two, herbs or berries. The Little Spinner features our patented pump mechanism that makes it easy to spin salad by simply pressing the soft knob. 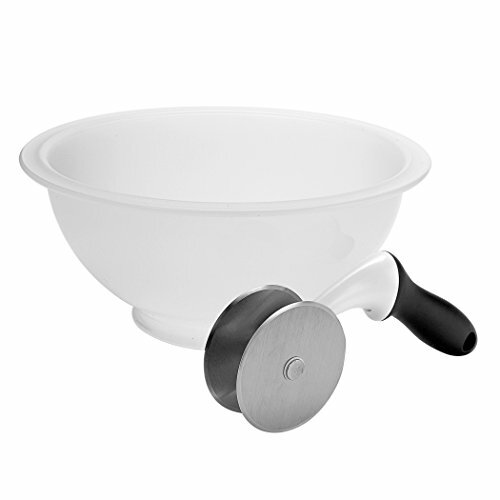 Our patented brake lets you stop the basket to unload it, and a non-slip ring keeps the bowl steady on the countertop. 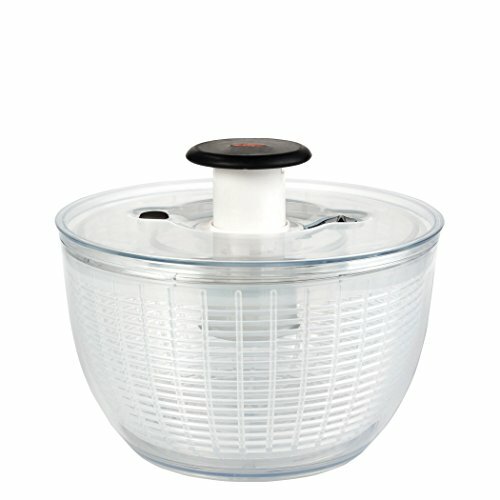 The knob locks down for convenient storage, and the basket and bowl can be used separately.Features include:Small version of the OXO GOOD GRIPS Salad SpinnerPatented pump mechanism and brake buttonSoft knob locks down for storage Non-slip ring on bowlBasket and bowl can be used separately10-cup capacityTop-rack dishwasher safe For warranty information, please Click here. Measures 8" diameter and 6" high.